they say the sun will make a space for you. say nothing of it; they let me pet their long manes. I hop on and we walk out to the end of wanting. What is God? I ask them. Something extraordinary occurs when we’re in the presence of a fellow sentient being. When we let go of language’s tacit conceptual constraints and judgments, we allow ourselves a kind of time travel toward our own inner animal. Science is revealing the ways that the physiology of our psychology can be found across species: the common neuronal structures and attendant nerve wirings that we share in varying measures with a startling array of both vertebrates and invertebrates, including fellow primates, elephants, whales, parrots, bees and fruit flies. Animal therapy makes us aware of this cross-species interconnectivity on the purest, subconscious level…It has been established that the tactile element alone in animal therapy releases endorphins, so called feel-good hormones that counteract the trauma hormones of adrenaline and cortisol. The horses in nearby fields are standing motionless. The pony already has a heavier coat; it seems too soon. Her eye is dark and large, the lashes scanty. the peace of the earth being milled. “Dark Horse” won “The Audience Award in the World Cinema Documentary Competition” at the 2015 Sundance Film Festival. Whether you are a horse person, or not (I’m not), this was something to see. Don’t miss it. 87 minutes of inspiration. Find it on Amazon Video. Came out of the far turn. Squared his shoulders. To a deafening roar. But as American Pharoah bounded into the stretch amid a deafening roar, the memories of the gritty Affirmed, the speedy Seattle Slew (1977) and that tremendous machine Secretariat (1973) were summoned from backside to grandstand, and rightfully so. Materiality gave chase for a mile, but American Pharoah picked up his tempo and shook that rival off at the mile. But not this time — Espinoza dropped the reins on his colt and let the muscled bay take him home. When he was a boy in his native Mexico, Espinoza had been afraid of horses. Now, at 43, he knew they were a gift. Beneath him, American Pharoah’s strides were getting longer and longer, but Espinoza felt as if he were riding on a cloud. There were a lot of other things he no longer had to deal with. in pursuit of a finish line and an order of arrival. Whoa Horse! I told you to stop, damn it! There is a story in Zen circles about a man and a horse. The horse is galloping quickly, and it appears that the man on the horse is going somewhere important. Another man standing alongside the road, shouts, “Where are you going?” and the first man replies, “I don’t know! Ask the horse!” This is also our story. We are riding a horse, we don’t know where we are going, and we can’t stop. 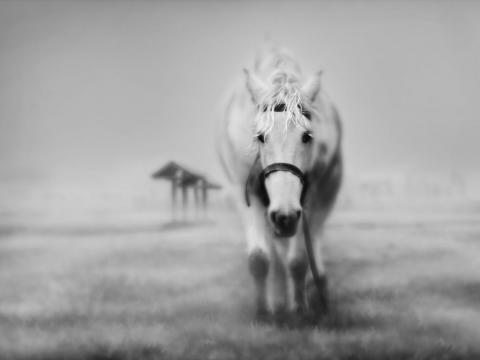 The horse is our habit energy pulling us along, and we are powerless. We struggle all the time, even during our sleep. We are at war within ourselves…We have to learn the art of stopping – stopping our thinking, our habit energies, our forgetfulness, the strong emotions that rule us. When an emotion rushes through us like a storm, we have no peace.